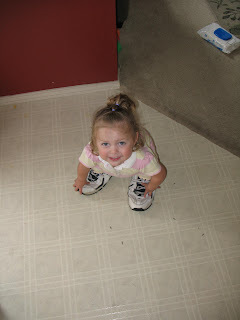 I was making lunch and looked behind me and saw little Avery trying so hard to walk in Daddy's shoes. It was so cute, I had to take a picture. She is growing up so fast!! Sadly what I notice the most is the fact that she has on short sleeves and shorts! Here on the other hand today is snowing!! Will it ever stop?? She is super cute so thanks for a smile on a poop day!! Too cute! 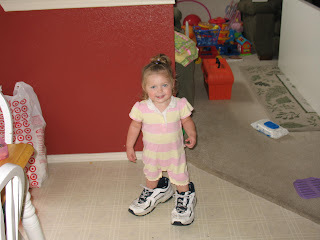 Emma loves to wear our shoes too...very fun! Go Avery!